I love essential oils, but I TOTALLY get how a lot of people are initially turned off by them. 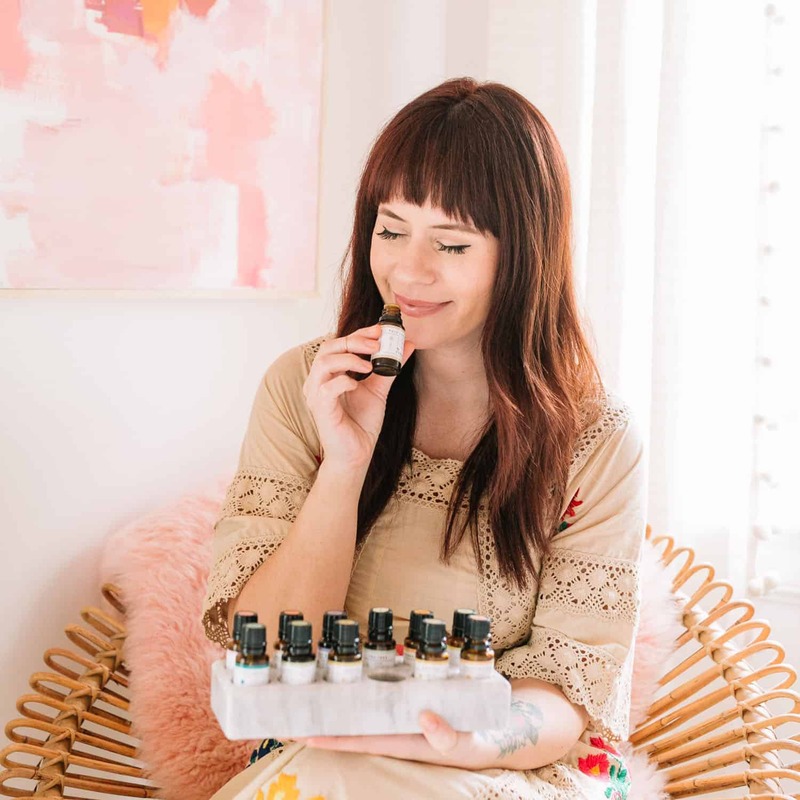 There is a lot of confusing information surrounding oils and when you first get started it’s hard to know what to do with all these little brown bottles. 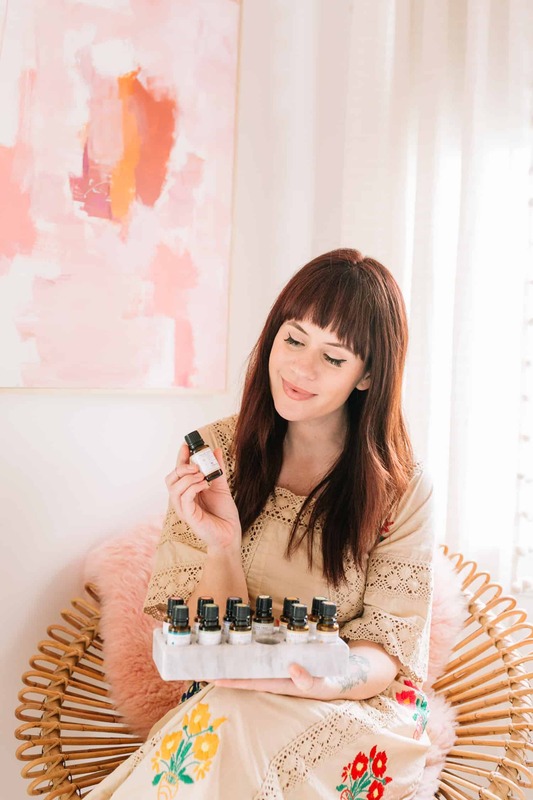 So today I wanted to share about how I got into using essential oils and how I typically use them in our day-to-day life. I took the scenic route in slowly getting interested in oils for the past five years. My initial introduction to oils was during a bout of insomnia I had while living in our previous home. In hindsight, I can see a lot of external factors for my poor sleep, but at the time I was desperate for a quick fix. So I bought a few oils and a diffuser from my friend who sold oils through one of the MLM companies. While I can’t credit oils exclusively for curing my insomnia (in the end, it was a combination of drinking less, keeping a more tidy bedroom, not using devices in our bedroom, PLUS my oils diffusing), it definitely helped to have a nightly ritual that signaled to my brain that it was time for sleep. I have been diffusing at night ever since. My next big step into oils came when we moved to Tennessee. We were in a new home and planning to start a family soon. 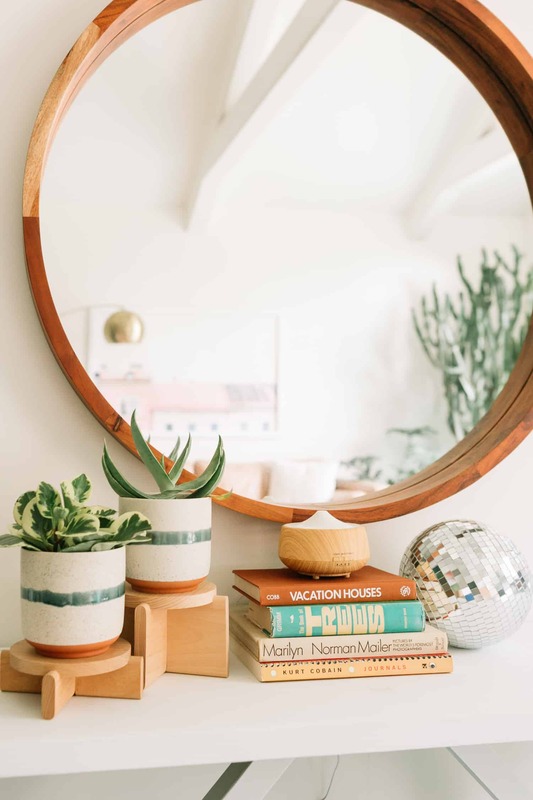 It was one of my goals to swap over to natural cleaning supplies (and also beauty, personal care … all of it really) and so I slowly started to learn more about ingredients in the products we were using and make my own (super simple) cleaning products and room sprays. This quickly became a hobby for me—I LOVE mixing up a little spray to spritz our rooms with while I am cleaning. I loved the feeling of knowing what was in my products and making them myself. For sleep, I have a few favorite blends. I always use Lavender mixed with something else. If I am stressed or anxious, I mix it with Frankincense (I love this scent!). If I just want my favorite comforting scent to fall asleep to, I mix Lavender with Fir Needle. I also mix in Ylang Ylang quite often. I keep it pretty simple with our bedroom routine because I believe that a very simple night routine is best for good sleep. In our home, I have now replaced candles with diffusers almost 100%. 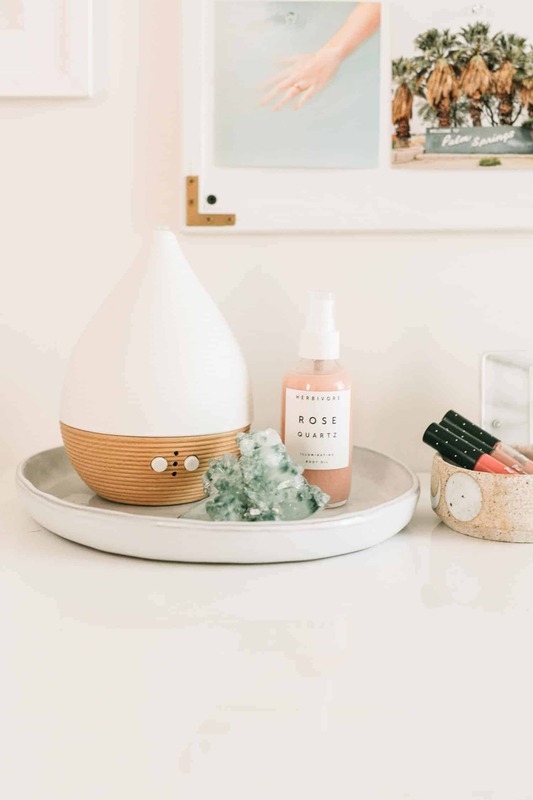 I still have a few (naturally scented) candles that I will use occasionally, but to be honest, none of them smell as good (or fill a room) like my diffusers do. Getting rid of candles is one of those things, kind of like dryer sheets, that freaks people out—maybe even makes them feel defensive at first. It’s obviously a personal choice (no judgment from me if you don’t want to give up candles—I get it!). That said, I will tell you the reason I gave them up. It was after learning that artificial fragrance (which is found in almost all candles) can be linked to asthma and trigger allergies*. After giving them up more than a year ago, I honestly don’t miss them at all anymore. 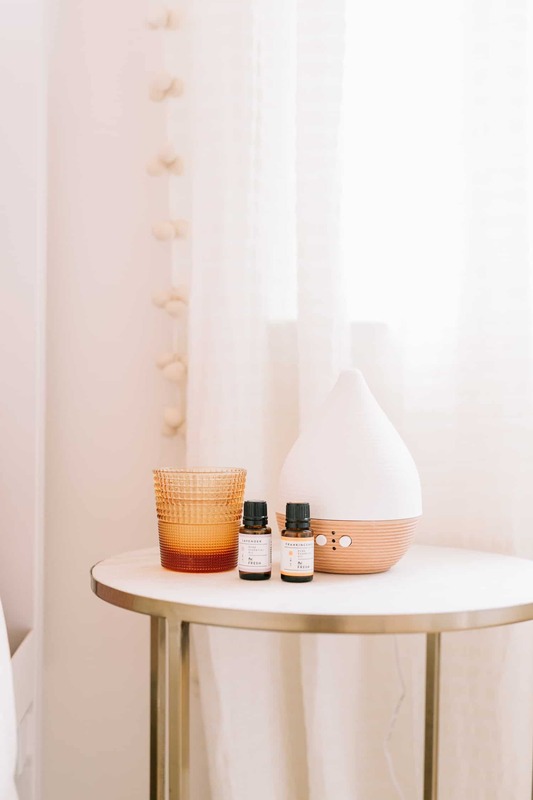 I love diffusing different oil blends to go with the seasons and my moods in place of candles. *Note: Feel free to do your own research! This is my opinion based on the research I have done. I try to be extremely conservative about statements like these, but I do believe that scented candles burning constantly in a home can be harmful to our health over time. My number one favorite blend for home is Fir Needle with Rosemary and Lavender. I enjoy switching it up for the seasons and trying random blends that people post online and making up new blends. In my office space, I tend to have two go-to blends. Either an immunity blend with Lemon, Eucalyptus, Clove and Cinnamon. Or a cozy blend like Fir Needle and Spruce with Grapefruit. If I need a fresh blend, my go-to is a few drops of Lemongrass with one drop of Spearmint or Peppermint. Beyond diffusing, here are a few ways I use oils in my everyday life. 1. I mix one drop of Frankincense oil in with my face oil as a booster. Frankincense is amazing for skincare. 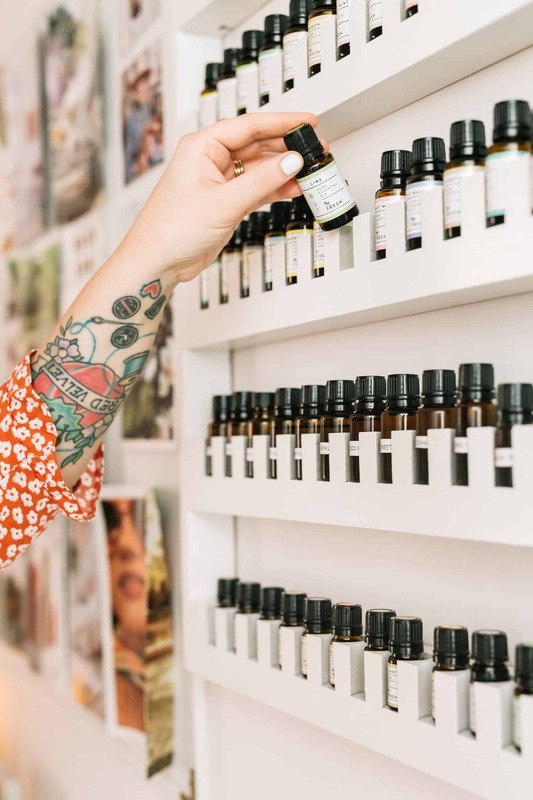 I won’t go on my long rant about how I don’t believe in “anti-aging” products in this post, but let me say that I’d rather have a bottle of Frankincense oil than any fancy serum or night cream you can buy at a counter at the mall. 2. I make my own room sprays and cleaning sprays using essential oils, distilled water and some soap if it’s a cleaning spray. They are so simple to make, smell amazing and work just as well as stuff I used to buy at the store! 3. I use wool dryer balls with Lavender and Fir Needle oil instead of dryer sheets for my laundry every day. 4. I mix a few drops of essential oils in with bubble bath or liquid soap in a small dish and add them to my bath water. Do this after the bath is done running, after you are already in it. That’s it! Super simple! There are a hundred more uses for oils, but this is just what I do in my day-to-day life! Credits/Author: Elsie Larson, Photography: Amber Ulmer. Photos edited with A Color Story Desktop.